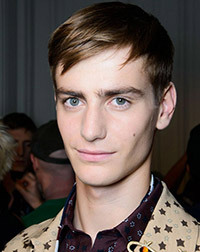 Ben Allen was born in Brockley, London, England, United Kingdom, on October 30, 1995, is an British male model. Allen was discovered on street Portobello Road in west London by model scout. He made his catwalk debut for Prada in Milan (2012). Ben's hobbies are football, cricket, travelling and photography. Harper's Bazaar China, Arena Homme +, ODDA Cover, The Hunger, Fantastic Man, 7TH Man, Esquire Spain, GQ Turkey, Harper's Bazaar Thailand Men, Esquire U.S., River Island, Flaunt, Apollo Magazine, L'Officiel Hommes Turkey, SID Magazine Cover, GQ Style China, GQ Russia, Men's Uno International Cover, The New York Times Style, L'Officiel Hommes Italia, I Love Fake, Vogue Hombre Cover, GQ Germany Cover. Peuterey, Furla, Sies Marjan, Trussardi, Calvin Klein, Jaeger, Scotch & Soda, Mango, Aquascutum, Bottega Veneta, Coach, Dior Homme, Cerruti, Gucci, Neil Barrett, Paul Smith. Walked runway for Dolce & Gabbana, H&M, Trussardi, Rochambeau, Prada, Fendi, Emporio Armani, Banana Republic, Rag & Bone, amfAR, Philipp Plein, Vivienne Westwood, 3.1 Phillip Lim, Dsquared2, Valentino, Pringle of Scotland, Corneliani, Wooyoungmi, Mihara Yasuhiro, 3.1 Phillip Lim, Marc by Marc Jacobs, Tommy Hilfiger. Represented by agencies New York IMG, Paris New Madison, Elite Milan, London Select Model Management, Barcelona View Management. I’ve been so privileged to work with some of the most visionary, creative and inspirational people in the industry. I try not to have idols, just live your life how you want to! I really loved going to the Natural History Museum and the Science Museum. I love clothes so picking one item is hard. I love my black Timbaland boots.